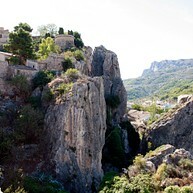 El Castell de Guadalest is a village located in Alicante province. In 1974, it was declared a place of historical and artistic interest. Years after, it was named a historical heritage site. In 2015, it became part of “La asociación Los Pueblos más bonitos de España”. 10-14 h. and 15-19 h.
In 1974, El Castell de Guadalest was declared a Historical Artistic Site and after, it was named a historical heritage site. Fortress of the XI century, it was built by muslims. It is located on top of a rock in the higher part of the area of the town. During the Middle and Modern ages, the castle was very important due to its strategic situation. The 1644 and 1748 earthquakes and the bomb attack in 1708 in the Succession War were responsible for its destruction. XI century fortress built by muslims. 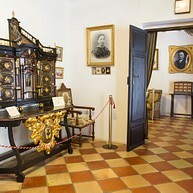 It is located in the property of the old Orduña house. Today all that is left is a restored tower. 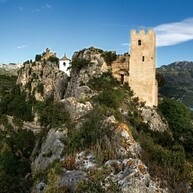 The “Grand House” of El Castell de Guadalest or “Casa Orduña” was built after the great earthquake of 1644, which devastated the region and demolished the buttress of the castle. It was built by the Orduñas, a family of Basque lineage. They came to the kingdom of Valencia with the Infante Fortuna de Navarra; they later went into the service of the Cardonas, admirals of Aragón. D. Sancho de Cardona received the title of Marques of Guadalest in 1543. As the family enjoyed the complete confidence of the marqueses, they were sent to Guadalest and served as guardians of the fortress and governors of the estate for almost three hundred years. XVIII century construction from the Baroque period, ascribed to José Sierra The church is situated in the old part of the town, just beside the Nobel house of the Orduña’s. This construction was built between 1740 and 1753 over the plot of land where the primitive temple used to be and dates from the Christian Conquest (XIII century). 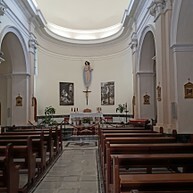 The church was burnt and plundered during the Civil War and was again changed in 1962, shortening its length and changing the ground floor, this led to the loss of the cupola and the transept. Between 1995 and 1996 we undertook the task of renovation and interior decoration in order to save the present day building. Building of the XII century, located on the bottom part of the Town Hall.